Ideas for Decorating Baby Nursery Rooms in a Cozy, Warm Cottage Nursery Style. A cottage nursery design has a cozy, comfortable feel. A warm, inviting place to relax with your baby. 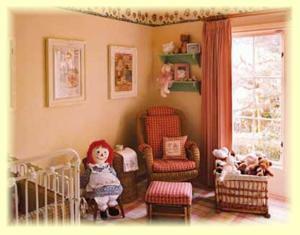 Cottage nursery decorating is a quaint and charmingly unfussy style. It's all about simplicity and warmth combining the past with the present. Faded autumnal colors of greens, creams and yellows or the soft pinks, mauves and peaches of spring. Solid, old style hardwood furniture in natural colors. Natural hard wood floors with scattered old-feel floral rugs. Wall-papered walls in floral prints. Alternatively, stenciling can be used to achieve the same effect. Cotton and lace combined with light floral crib bedding patterns and embroidery. Accessories such as wicker baskets, wooden frames, earthenware pots and flowers. If you feel inspired to decorate in a country or cottage style you'll find all the country decorating information you need here. Don't forget to check out the baby rooms gallery for more inspiration and ideas for decorating baby nursery rooms in a cottage style.